Similar to plots of great stories, a consumer goes through certain stages in their buying process. This journey has become more complex over the last few years because of multiple touch points on the purchasing path. 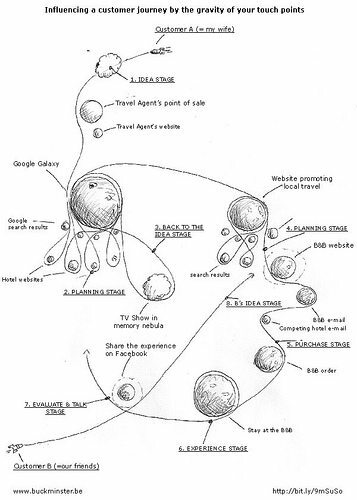 Touch points are the channels that reach the customer and influence his or her decision in the buyer’s journey. These channels include referrals, social media, PPC, email, search, blogs, and other marketing efforts. 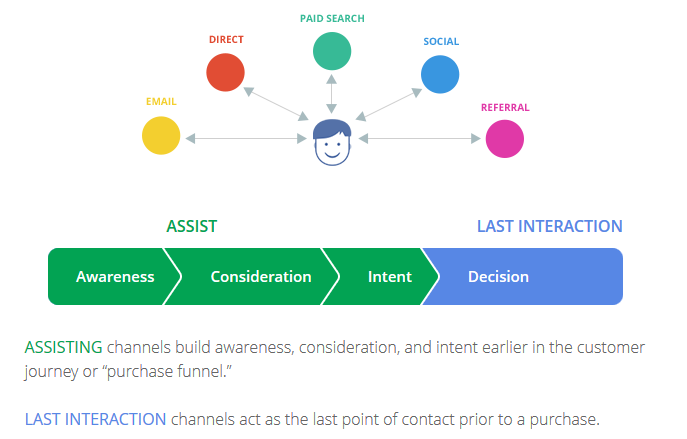 Knowing the buyer’s journey will influence your content marketing strategy. Content marketing is a key player in positioning your company as a thought leader and increasing conversions. Custom content is more than just content, though, it is building a relationship with consumers and strengthening your branding. A company’s branding should give the consumer a positive “gut feeling” about the company. Sixty percent of consumers have a positive gut feeling about a company after reading custom content on their website. That’s why content like blogs, videos, infographics, eBooks, guides, and whitepapers play a crucial role in influencing a consumer along their journey to buy from you. Let’s take a look at the different stages of the customer journey and what content should be used for each stage. According to Google, there are two roles a company’s content should play in the buyer’s journey: assist interaction and last interaction. Assist interaction is shown through content that is created specifically to get the attention of potential customers. There are three stages of the buyer’s journey that should be “assisted” by your content. Every single person is in the buying process whether they realize it or not. Instead of a funnel, the buying process looks more like a circle or a round-a-bout exploration of the planets if you go by the picture above. Those spontaneous buys really aren’t spontaneous at all. You can’t walk through life without being inundated with advertisements, word of mouth and reviews on social media, and cleverly placed PPC ads while you search. That spontaneous buy started with a discovery. Maybe a friend wore a similar shirt or maybe you saw it on Pinterest. A seed of desire was planted and will lay dormant till something triggers it to go to the next stage. During this first stage, social media, blog posts, and paid search play a critical role in sparking the seed of desire. People don’t know what they want till you show it to them. Another assist role, content created in this phase will help the buyer decide whether they should buy the product and which brands they should be considering. The decision criteria phase is all about collecting information. Consumers will spend hours searching on the internet and reading reviews. Infographics, review videos, and informative website content should be created specifically to speak to the consumer in this part of their buying process. The more informative content they receive from a company the more likely they are to purchase from them. Don’t forget to include guidance to the next step within your content. This type of content on a company’s website helps humanize their brand and feed passion for their products. In this stage, content will be created for the last interaction role. At this point, the consumer knows what they want and will be searching long tail keywords. Your company should help the consumer by providing content that shows comparisons or guides on how to use the product. Create a table or video demonstration that shows cost/benefit between your product and others. Choosing the right wording and product display online can make or break the sale. You might have thought the purchase step would be the last part of the buyer’s journey but you would be wrong. Remember, it’s a circle. Advocacy is the third time that assist interaction content is used. Encourage the buyer to share their purchase via their social channels. Follow up and ask for a review. User generated content plays a significant role in the research phase of a potential customer. So encourage it! You should also create content that’s fun for fans to share. If you’re a cookware company, create unique recipes for that time of year or, better yet, host a contest for fans to use your products to create their own recipe. Not only will this encourage your fans to share your brand’s content with friends but also build brand loyalty and make them repeat customers. Unlike campaigns that have a definitive start and finish line, content marketing should be a continual effort. Content plays an important role in the customer journey but it also is a major factor in increasing your search engine ranking. It’s important to put together an editorial calendar and strategy to target each person in their different phase of the buying process. Alicia is a Content Coordinator at WebFX where she loves helping clients communicate better with consumers.